The easiest way to detox your body, especially if you suffer from allergies or have just had an anaphylactic reaction. Over the last 20 years, the number of people suffering from allergies and chronic diseases has increased considerably. Allergies and chronic diseases are always accompanied by an impaired immune system. Proper functioning of the immune system can be negatively influenced by metabolic disorders, pollution (ie. by the air or amalgam), an unbalanced diet, or increasing age. The body’s excretion pathways may be able to counteract these negative influences for a time, but become over taxed by long-term exposure. This leads to a build-up of toxic substances through out the body with far-reaching consequences. and 3 litres for men. 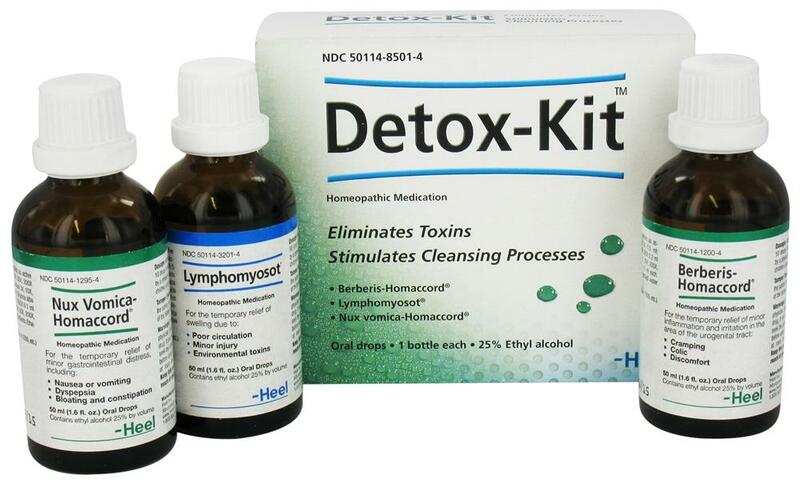 Re-activation of the body's own detoxification systems (lymphatic, gastrointestinal, hepatic, renal and biliary) with Heel Detox-Kit. Minimum of 6 weeks i.e two Detox-kits. In chronic disease, it is recommended to detox twice a year. Week 1: Add 10 drops of each preparation to a bottle of water (1.5l), shake lightly and drink during the course of the day. Week 2: Add 20 drops of each preparation to a bottle of water (1.5L), shake lightly and drink during the course of the day. Week 3: Add 3 drops of each preparation to a bottle of water (1.5L), shake lightly and drink during the course of the day. The healing crisis can appear - feeling ill (flu-like symptoms, headache...) but it is only for a short period. It just shows that your body’s own toxins are coming loose and that the remedies are working. If you experience the “healing crisis” effect, the amount of drops can then be decreased to 10 drops per remedy in 1.5L water per day and slowly increase the drops every morning till 30 drops each as tolerated. This is a composite of homeopathic ingredients specifically formulated to support the normal function of the lymphatic system. It is effective in supporting the elimination of toxins via the lymph and circulatory systems. Nux Vomica is the homeopathic remedy for detoxification via the digestive system. It supports and maintains normal liver function and is effective for elimination of toxins resulting from drugs, alcohol and poor diet. It provides organic support during a detoxification program. Reneel acts on the urogenital system and support normal organ function. These remedies support elimination of toxins via the urinary pathways. Lymphomyosot acts on the Lymphatic system. Contraindications: In case of thyroid disorder, Lymphomyosot may not be administered without prior approval from a physician. Please Note : Indent Item only - usually available within 5 days, unless NZ distributor is out of stock.